This should only be done when the vehicle is stationary. 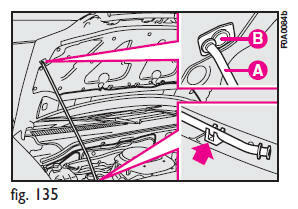 Before opening the bonnet, check the windscreen wiper arms are not lifted from the windscreen. 1) Pull the yellow lever A-fig. 133 in the direction of the arrow. 2) Raise the bonnet slightly until locating the release lever. 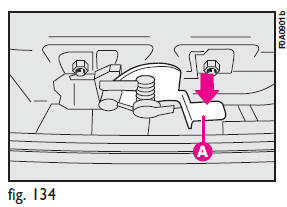 3) Press the fastener A-fig. 134, as shown in the figure. 4) Open the bonnet and release the rod A-fig. 135 from its clip at the same time. Then B on the bonnet. Important. The bonnet might fall violently if the support rod is not positioned properly. When the engine is hot, mind your hands when working inside the engine compartment to avoid burning yourself. Never put your hands near the fan: it could start up even without the key in the switch. Wait until the engine cools down. Take care that scarves, ties or loose clothing do not accidentally come near moving parts; they could become entangled with serious danger for the wearer. 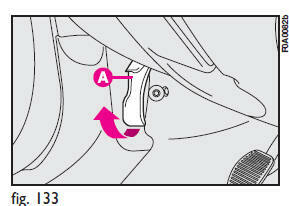 1) Hold the bonnet up with one hand and, with the other, remove rod Afig. 135 from recess B and replace it in its clip. 2) Lower the bonnet until it is about 20 cm above the engine compartment, and then let it drop, ensuring that it is fully closed and not just held in position by the safety catch. If the bonnet does not close properly do not push it down but open it again and repeat the above procedure. For safety reasons the bonnet must be closed properly to avoid its opening while the vehicle is traveling. Therefore, always check it is properly closed and the catch engaged. Should you notice that the catch is not perfectly engaged when traveling, stop the vehicle immediately and close the bonnet.